Officer Regina Tasca Goes "Rogue"
A peace officer on duty: Regina Tasca intervenes to stop a criminal assault. Regina Tasca is a “rogue cop” – and God bless her for it. Her first supposed offense -- which wasn't mentioned until after the second -- was a failure to assist another officer who was “attacked” by a drunken woman who was roughly half his weight and barely five feet tall. Her second was was to intervene when a police officer from another jurisdiction viciously assaulted an emotionally troubled young man who was not suspected of a crime. “I consider myself a peace officer,” Tasca told Pro Libertate. “My thing is to help make sure that people are safe, and that they don’t have a reason to fear the police – that we treat them like human beings. The incident that started all of this was one in which I intervened to prevent excessive force against a kid who was the subject of a medical call, not a criminal suspect." 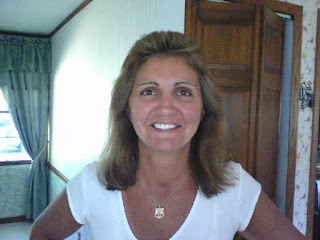 On April 29, 2011, Tasca was on patrol when she got a call for medical assistance. Former Bogota Council Member Tara Sharp, concerned about the erratic behavior of her 22-year-old son Kyle, called the police to take him to the hospital for a psychological evaluation. Requesting police intervention, particularly in cases of this kind, is never a good idea. Sharp was exceptionally fortunate that Officer Tasca was the first to respond: She has years of experience as an EMT and had just completed specialized training on situations involving psychologically disturbed people. Once on the scene, Tasca acted quickly to calm down the distraught young man. “When the call came, I heard that a couple of officers from Ridgefield Park were coming to provide backup, which I thought was OK, Tasca related to Pro Libertate. “Kyle had been shouting and swearing when I got there, but I got him calmed down.” The young man’s mood changed abruptly when he saw the other officers arrive. Sgt. Chris Thibault tackled Kyle, wrapped him in a bear hug, and attempted to handcuff him. Within an instant, Sgt. Joe Rella piled on and began to slug Kyle in the head while his horrified mother screamed at the officers to stop. Tasca instinctively did what any legitimate peace officer would do: She intervened to protect the victim, pulling Rella off the helpless and battered young man. Eventually the Ridgefield officers handcuffed Kyle – then turned their fury on Tasca. Two days later, Tasca was summoned by her captain, who informed her that she was being suspended pending a disciplinary hearing. She learned that in addition to “using force” to stop Rella’s assault on Kyle Sharp, Tasca was accused of failing to assist Bogota Officer Jerome Fowler when he was “assaulted” by an intoxicated woman on April 3. “Nobody had said anything to me about the earlier case until after the incident with the Ridgefield officers,” Tasca pointed out to me. The young woman was taken to the Emergency Room at Holy Name Medical Center. This was the “assault” that figures so prominently in the charges against Tasca. 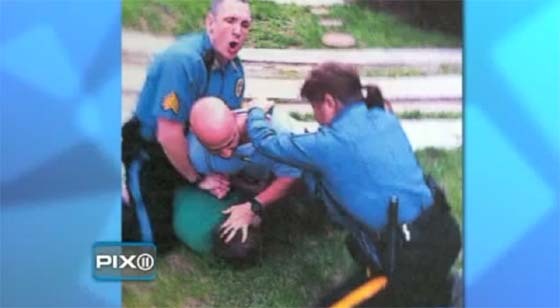 The officers who ganged up on Kyle Sharp have not been charged or subjected to administrative discipline – but Tasca’s refusal to help ground and pound a tiny, intoxicated woman who had made incidental contact with a fellow officer is being treated as a career-imperiling delinquency. “Apparently, Jay believed I should have pushed all these people aside and help him subdue a tiny girl -- she was about five foot one, and very skinny – who had given him a scratch,” Tasca pointed out. After being put on suspension, Tasca was subjected to a psychological evaluation by Dr. Matthew Geller, a psychiatrist who does contact work for New Jersey law enforcement agencies. Geller provided the diagnosis he had been paid for, ruling that Tasca was unfit for duty. At the same time, the Bogota PD’s internal affairs officer produced a report concluding that Tasca’s refusal to assist Officer Fowler in the April 3 incident demonstrated her unfitness. Tasca, an openly gay female police officer, believes that at least some of the problems she’s experienced are the product of a cultural clash with what she describes as “the Old Boys Club.” More importantly, however, she has been targeted for the unforgiveable offense of “crossing the Blue Line” by taking the side of a Mundane being attacked by a member of the Brotherhood. “I’ve been an officer here in Bogata for eleven years, and spent seven or eight years as a Class 2 Special Officer in Fairview, which is where I grew up,” Tasca told Pro Libertate. “Until now, I’ve never had problems with anybody on the force, or anybody in the community. Oh, sure, when you work near people for ten or twelve hours every day, you’ll have disagreements and maybe say some things you shouldn’t, but that’s typical of just about any relationship, professional or otherwise. But never in my career had I been accused of unfitness for duty until after that incident a year ago. As a veteran with nearly twenty years in law enforcement, Tasca has noticed a dramatic change in the institutional culture of law enforcement in recent years. Ramon Perez and his family. In contemporary law enforcement, commitment to the Golden Rule is a firing offense. Just ask Ramon Perez, whose experience is strikingly similar to that of Regina Tasca. Perez, a probationary officer who had won the top leadership award at his police academy, was cashiered by the Austin, Texas Police Department as a result of his refusal to use a Taser on an elderly, non-violent man during a domestic disturbance in January 2005. The order was unconstitutional, illegal, a violation of the guidelines in the department’s handbook and, most importantly, immoral. A few days after that incident, Perez was given a punitive transfer to the night shift. Two months later, Perez was told to report to APD psychologist Carol Logan to undergo what he was told would be a “communication” exercise. 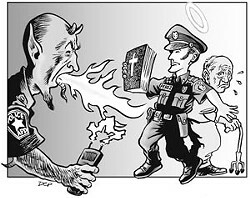 In fact, it was a disguised “fit-for-duty review” intended to ratify the pre-ordained decision to fire him. Logan’s four page report focused entirely on Perez's moral and religious beliefs. Perez is a self-described non-denominational fundamentalist Christian, an ordained minister who home-schools his children. He is also firmly convinced that protection of civil liberties is the paramount duty of a peace officer – a duty he regarded, literally, as a sacred trust. As was the case with Regina Tasca, Ramon Perez’s detractors dredged up a second incident of “misconduct” involving a refusal to use unnecessary force. By twice displaying a peace officer’s preference for de-escalation, Perez had established himself as a repeat offender. He was purged from the APD, a department that has since done much to distinguish itself – in the face of fierce and plentiful competition -- as one of the most abusive in the country. A vast geographic and cultural gulf separates Ramon Perez, a Fundamentalist Evangelical from Texas, and Regina Tasca, an openly gay Roman Catholic from New Jersey. They have at least one critically important thing in common: Both of them intervened in defense of helpless citizens facing criminal violence from fellow cops, and learned that for people who have chosen a career in law enforcement, behaving like a peace officer is a firing offense. ... to everyone who has donated to Pro Libertate! While supplies last, I'm still sending out a signed copy of Liberty in Eclipse to anyone who donates at least $20 to help keep this blog up and running. Once again, we're very grateful for your help. God bless! 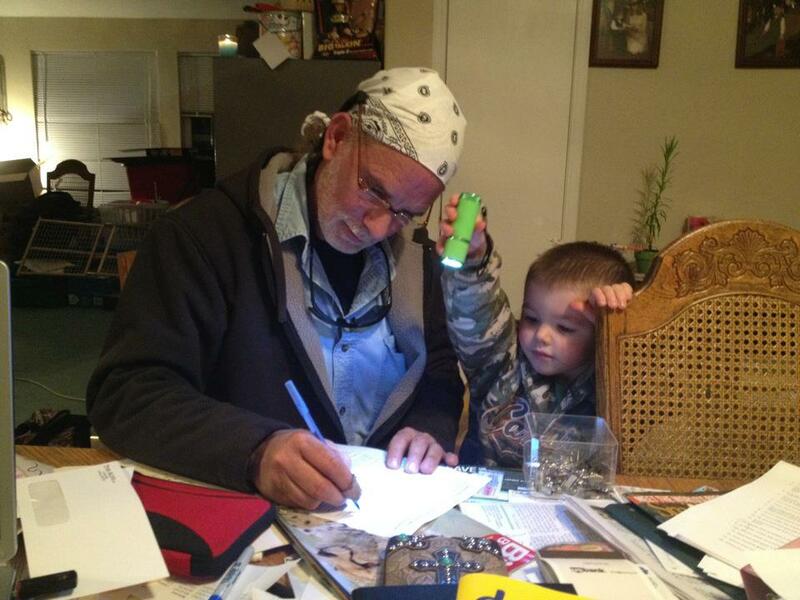 Behold the man who terrorizes the Sunriver Police Department: Bob Foster and his grandson. What does it take to be officially designated a “stalker” in the State of Oregon? In a recent decision the State Court of Appeals ruled that a bully can subject a terrified elderly woman to a years-long campaign of harassment, intimidation, and physical violence without being saddled with a stalking protection order (SPO). Two years ago, the same court ruled that an individual can commit repeated acts of property damage, coupled with physical assaults and even an explicit death threat, and not qualify for stalker status. Roughly two years ago, Foster – a well-established and widely respected local businessman who operates a hot tub service company – was designated a stalker in an ex parte proceeding. Since that time he has been arrested twice for the supposed crime of coming within eyeshot of one of the timid, shivering creatures who supposedly live in bladder-loosening fear of Foster – Sergeant Joseph Patnode and Officer Kasey Hughes. Foster has never said or done anything to harm either of those proud, intrepid members of the Brotherhood of Coercion. Prior to the arrests made pursuant to the spurious stalking protection order, Foster had no criminal record of any kind. Over the past two years, Foster has been treated as a prisoner in his own hometown. At one point last fall he was driven into out-of-state exile for three months to avoid arrest as he prepared for a January 26 court date. Rather than convening the trial on the appointed time at the designated location, the presiding Judge conducted a series of sidebar conferences with the parties in her chambers while dozens of people waited for several hours in a crowded, poorly ventilated courtroom. In the far corner of the small room could be seen a poorly-disguised Detective from the Deschutes County Sheriff’s Office, who furtively took photographs of everyone who had gathered to support Foster. A typically spectacular Sunriver vista. In the middle of the courtroom had assembled practically the entire Sunriver Police Department. All of them but Hughes and Patnode were in uniform and wearing body armor. They were also wreathed in the unmistakable aroma of pure, unfiltered fear. This shouldn't surprise us: These are people who profess to be terrified by the mere sight of a skinny, mild-mannered, unarmed, 51-year-old businessman whose only weapon is a finely whetted wit. Bob Foster and his daughter, Rebecca Kossler, were as eager for their day in court as the Sunriver PD was to avoid it – a fact that says everything we need to know about the relative merits of their respective cases. If Foster's accusers were telling any portion of the truth, they wouldn't be exhausting every dilatory tactic known to man in an effort to avoid testifying under oath in an adversarial setting. In defiance of State Law, the original SPO was granted without a mandatory hearing at which Foster could contest it. His court appearance on January 26 was the first time he was able to speak for himself in a judicial proceeding. Rather than permitting Foster the opportunity to tear apart the specious case against him, the presiding judge attempted to fashion a modified order under which Foster would be granted the supposed privilege of a judicial hearing before the “victims” – Officers Patnode and Hughes – could arrange for his arrest. The Sunriver PD faction refused to drop the charges against Foster because, as they explicitly told the judge, they were concerned that he would sue the department for the taxpayer-subsidized harassment he has experienced. Assuming that his persecutors could be held personally liable, rather than socializing the costs of their criminal foolishness, Foster would be entitled to sue them into penury: During the past two years he has spent more than $200,000 contesting the patently false and unambiguously malicious accusation that he had been stalking the local police. In sworn pre-trial depositions, neither of the “victims” of Foster’s purported stalking was ever to describe an instance in which he did or said anything so much as suggesting violent intent. The same is true of former Sunriver Police Chief Michael Kennedy, who – as we will see – has since lost his position and offered several key disclosures regarding what can only be called a criminal conspiracy against Foster. Foster’s supposed victims are armed individuals claiming a license to use lethal force at their discretion – and who supposedly dissolve into puddles of petulant panic at the sight of him. Pedro Erazo’s victim, by way of contrast, was a senior citizen named Kathryn Reitz, whom he repeatedly harassed, threatened, and physically assaulted at the Goodwill convenience store in Hillsboro, Oregon. Over the course of two years, Erazo and his cohorts would descend on the thrift store in pursuit of severely discounted books to re-sell online. Three times a day, employees would wheel out large bins full of merchandise, including books. Heedless of rudimentary courtesy, Erazo’s group would shove aside other shoppers – and, on occasion, store employees – in order to scoop up armloads of books whose barcodes would be read by a handheld digital scanner. Any potentially valuable volumes would be piled in a cart. Reitz attracted Erazo’s malign attention by voicing disgust over his behavior. He retaliated by following her around the store, barraging her with insults and threats. As it happens, the thrift store chain’s management did stop him: Erazo is now banned from 40 stores in Northwest Oregon and Southwest Washington. At Reitz’s request, Washington County Circuit Court Judge Donald Letourneau imposed a stalking order against Erazo, who was one of several people to complain about the tactics he employed. Despite the fact that Erazo and his gang had clearly engaged in aggressive and violent behavior, the Oregon Court of Appeals overturned the stalking order. Oregon state law requires at least two “contacts” in which the victim would have a “reasonable apprehension” regarding his or her physical safety. While Erazo had physically assaulted Reitz on one confrontation, and assailed her with insults and threats during numerous others, a second violent “contact” would be necessary in order for his behavior to qualify as “stalking” under state law. 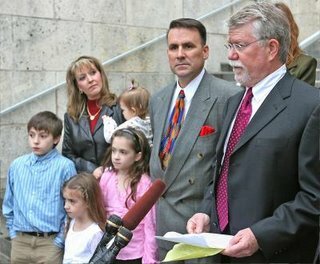 Stipulating to the facts as related by the Swarringim family, the Court of Appeals threw out the stalking order, maintaining that the evidence was insufficient to establish that the actions of Olson and his son had caused “reasonable apprehension for personal safety” on the part of the victims. Obviously, it is difficult to make a stalking order stick in the State of Oregon, even when the subject of the order has committed acts of criminal violence and made explicit death threats. The designation of “stalker” is reserved for truly dangerous people like Bob Foster, whose sole offense was to make the police uncomfortable. Foster was a prominent opponent of both the SROA and the proposed Special Services District (SSD), which was created in 2008 and inflicts an annual cost of several million dollars on Sunriver home owners. 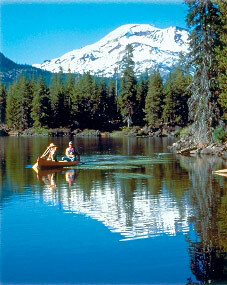 Sunriver – although a lovely place -- isn’t really a town; it is a shopping mall with a thyroid condition. The Census Bureau considers it to be part of nearby Bend. Until 2008, its streets were not considered “public conveyances,” but rather private roads accessible to the public. This meant that the Sunriver PD couldn’t write traffic citations, much to the frustration of those who coveted the revenue. 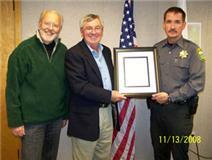 In 2007, the SROA successfully lobbied Oregon State Rep. Gene Wisnat to sponsor H.B. 3445, a bill custom-tailored for Sunriver that extended police "authority" to include roads and streets on "premises open to the public that are owned by a homeowners association…." The following year, the SROA enacted a special multi-million-dollar tax assessment for a special service district (SSD) it had created in 2002. The SSD now included a fully functional police department, which immediately became a huge nuisance to local business owners and the visitors upon whom the local economy depends. 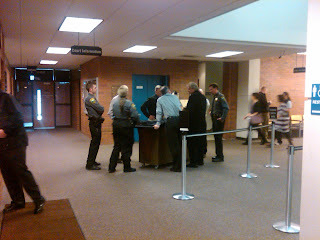 Strategy session: Sunriver officers during break in the Jan. 26 hearing. On more than a few occasions, an aggravated Hutcherson confronted the officers in her parking lot. “They didn’t care for me much,” she wryly observed. In her interview with the investigator, Danyl Dahl described a March 2009 episode in which the deli delivery van she was driving was stopped by two Sunriver officers who – in response to a trivial traffic infraction – approached her with guns drawn and faces drawn taut with irrational rage. The Sunriver police were just as inhospitable to visitors – something Shawn Vickers, who was stopped for speeding, witnessed first-hand. During the traffic stop, a tourist riding a bicycle stopped and began taking photos of the police vehicle. “Are you kidding me?” exclaimed an astonished Vickers, who was still seated behind the wheel of his vehicle. This provoked another outburst: “He was like, `Freeze! Put your hands where I can see them! Do not move!’ He moved about 6-7 feet from me. He never turned his back to me.” As it happened, the bicyclist was a visiting sheriff’s deputy from Los Angeles County who collected photographs of police vehicles. Upon learning of the tourist’s identity, the officer regained at least a portion of his composure. For several anxious moments, however, “I thought this guy was going to lose it and draw down on one of us,” Vickers reports. A Sunriver resident who identified herself only as “Vicki” told the investigator about asimilar incident she witnessed in October 2010 involving three Sunriver police officers who swarmed a car containing an elderly couple “with guns drawn and pointing at them.” The elderly couple weren’t armed fugitives; at worst they had committed a minor traffic infraction. Yet they were threatened with lethal violence by a police department perversely determined to manufacture work for itself. April Gossling, who operated the Villagio Espresso shop, recalled anApril 2011 incident in which three Sunriver Police officers pulled over a group of teenagers who were found with alcohol and marijuana. She overheard the police “threatening them – telling them how much trouble they were in, and how they needed to report to them” regarding drug and alcohol use by other kids. One of the officers wasn’t satisfied merely to cultivate a group of informants: He prevailed on one of the underage girls to supply him with her phone number in a conversation involving the suggestion of “sexual favors,” Gossling testified. During this lengthy encounter, Gossling overheard an emergency call on the police radio that was blithely ignored by the officers. Unremitting harassment by the Sunriver PD led at least one resident to flee the town. In some cases, Lewis reports, Officer Kasey Hughes – one of the two gallant defenders of the public weal who filed a stalking order against Foster – followed him “for miles at a time before stopping me.” In one particularly crowded day, Lewis was stopped four times by four different Sunriver PD officers. Obviously, many Sunriver residents recognized that the police department – and the quasi-private municipal cabal running it – constituted a large, festering problem. However, only Bob Foster was willing to confront those responsible for it. 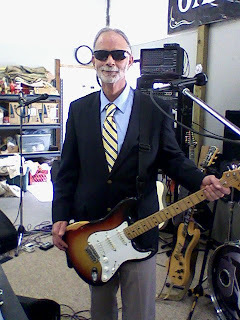 Sharp-Dressed Man: Bob Foster with his Stratocaster. In public meetings, Foster denounced the Service District as an unnecessary expense that consolidated the grip of the village’s insular ruling elite. He proposed abolishing the District and contracting with nearby La Pine for emergency services – an arrangement that would have saved Sunriver home owners a great deal of money and reined in the power of the SROA. In reprisal, the SROA concocted a plot to silence the civic-minded businessman. This is not a matter of speculation: The key player in that conspiracy, former Sunriver Police Chief Michael Kennedy, has provided an admirably candid summary of that conspiracy in a March 8 letter to the Deschutes County Commission. Kennedy wrote that letter to file a grievance with the Commission after being fired on February 16 in what he described as an act of retaliation by a corrupt and unaccountable municipal government whose official dealings are as opaque as the proceedings of the North Korean Politburo. The conspiracy to railroad Bob Foster on “stalking” charges was prominent among those “unethical” acts to which Kennedy refers. After growing weary of what was described as Foster’s “unwanted attention,” Kennedy approached the SROA and requested “that Bob Foster be trespassed from the SROA/Police building,” the former Chief recalled. This would mean that Foster wouldn’t be able to attend public SROA meetings, or file a police complaint, without being subject to arrest. Kennedy’s suggestion, if act on, would have been an act of petty, officious retaliation, but it wasn’t a criminal conspiracy. What the SROA suggested does meet that description. Unfortunately for the SROA, Bob Foster “didn’t immediately roll over,” Kennedy recalls. Instead, he gave notice that he intended to file lawsuits against the SROA and the Service District – which, as Kennedy points out, are essentially the same entity. “The current management structure of the Sunriver Service District puts entirely too much control in the hands of a small segment of the community,” Kennedy explained to the County Commission. “The end result is that a private home owners association has effective control over the operations and funds of a public taxing district.” (Emphasis added.) That same entrenched cabal uses the Sunriver PD as its enforcement arm and revenue-extraction mechanism. Seeking to limit the potential damage from the lawsuit, the SROA “appeared to be attempting to withdraw Service District protection from the two officers” it has used to file stalking orders against Foster. *The private SROA, in defiance of conflict-of-interest laws, controls a public taxing district and the police department – just as Bob Foster had predicted it would. *The stalking case against Foster was instigated by the SROA, with the connivance of the police department; it had nothing to do with any criminal conduct on Foster’s part. *The SROA and Service District were using funds extracted from Sunriver tax victims to finance its vendetta against Foster. After Kennedy was cashiered, he was reportedly given a severance package of $100,000 – a rather extravagant amount for a minor bureaucrat who managed a tiny police force in a tranquil resort community with a permanent population of fewer than 1,000 people. If the SROA’s intention was to buy off Kennedy, they badly underestimated the price of his silence – and misunderstood the magnitude of his admissions against interest. Kennedy insists on being reinstated as Sunriver Police Chief. He also demands the resignation of five directors of the SROA, and the disbanding of the special service district. That last demand is another vindication of Bob Foster, who made the same proposal five years ago – thereby provoking the lengthy and expensive campaign of criminal harassment in which Kennedy eagerly participated until it became personally risky to him. Disbanding the service district is necessary but insufficient. The only adequate remedy would be to add Sunriver, Oregon to the lengthening roster of small towns that have been relieved of the burden of a municipal police department. Chances are, Kind Reader, that the city in which you live would benefit from the same kind of "neglect." ... for your continuing support for Pro Libertate. 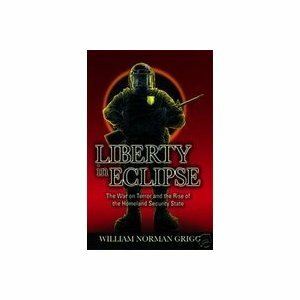 We're still offering a personalized copy of Liberty in Eclipse to everyone who gives a donation of $20 or more. Thanks once again, and God bless! The question seemed harmless, as did the questioner, Sgt. Tim Soronen of the Demopolis, Alabama police department. Diane Avera, the 45-year-old grandmother from Meridian, Mississippi to whom that question was posed, couldn’t see any harm in answering it candidly. “I came over to buy some Sudafed for our scuba diving trip this weekend, since we can’t buy it in Meridian anymore,” Mrs. Avera explained. “No, sir, I did not know,” the startled woman replied. “I need you to step out of the car,” Soronen demanded. “For what? I swear I didn’t know. What did I do?” Avera asked in alarm. Using the threat of kidnapping Avera’s grandchildren, Soronen extorted from the terrified woman a confession that she had knowingly purchased Sudafed for the purpose of manufacturing crystal methamphetamine. After more than a month in a government cage, Avera was released from jail on $51,000 bail. If Avera had been a meth dealer, she almost certainly would have accepted Griggers’ offer. As an innocent woman whose unwitting violation of an obscure technical statute had injured nobody, Avera contested the charge. During Avera’s three-day trial, Judge Eddie Hardaway gave Griggers generous latitude to make entirely unsubstantiated claims, among them that Diane had confessed that she and her daughter had been using meth for at least two years. He also insisted that Avera had somehow “diluted” drug tests she had undergone after being bailed out of jail – a charge that was refuted by the clinicians who had examined the samples. Avera was found guilty of conspiracy to manufacture crystal meth and sentenced to a year in prison with an additional seven years of probation. She was released two months later after filing an appeal, and remains free today on a $20,000 appeal bond – if the word “free” applies to someone living in the shadow of a prison sentence. New hobby: Diane Avera on a scuba expedition. It wasn’t allergies that prompted Diane to buy Sudafed in the middle of the summer – it was her newly acquired hobby of scuba diving. 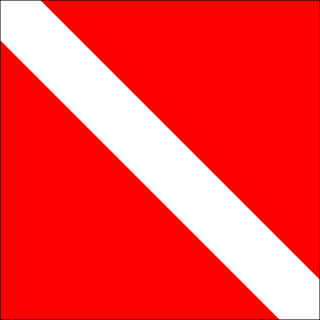 In his own letter to Judge Hardaway, RC Sample, the Master Scuba Diver Trainer (MSDT) who instructed Diane, testified that “when Diane would travel to depth, she had difficulty equalizing the pressure at the boundary of her eardrum of a number of reasons … relating to her sinuses,” a condition that can be treated through the judicious use of pseudoephedrine. The explanations offered by Sims, Sample, and Gilton are perfectly reasonable and should be sufficient to convince any rational person. The deranged people responsible for the Drug War would probably view those letters as an admission that Avera’s scuba club is a front for a meth manufacturing ring. In fact, that was essentially the charge made by DA Griggers in court, when confronted with more than a score of people who had come to act as character witnesses on Diane’s behalf. “He claimed that all of these people were somehow involved in meth trafficking,” a disgusted Keith Avera told Pro Libertate. Perhaps we should expect to see “Diver Down” bumper decals added to the informal profile used to conduct forfeiture-focused pretext stops. I wish I were kidding. In the company of her 27-year-old son Larry, his girlfriend Shana, and three small children (her grandsons Gavin and Caleb, and the girlfriend’s nephew), Avera made two stops – the first to the CVS pharmacy, where he son and his girlfriend each bought a box of Sudafed, and then to Wal Mart, where she bought another, in addition to crayons for the grandchildren. At the time the Demopolis PD was “conducting a sting operation,” reported the Jackson, Mississippi Clarion-Ledger. As it happened, the oh-so-helpful pharmacist at CVS was a police informant. “If it’s against the law” to make an out-of-state Sudafed purchase in Demopolis, Diane asked the officer, “why did Wal Mart sell it to me?” Soronen was too busy calling for back-up to reply. Within a few minutes two additional officers arrived and started to search the vehicle. “How much Sudafed did you buy?” Soronen demanded of Diane. “I only bought one box,” she replied. “So, if I search the truck I’ll find one box of Sudafed,” he persisted. Up to this point – as her ingenuous candor demonstrated -- Diane assumed that she was mired in a misunderstanding, rather than caught in a trap. When Soronen told her that he could “call in the DEA to come down here,” she mistakenly assumed that the officer was trying to help, rather than making a veiled threat. By this time, Soronen surely knew that he wasn’t dealing with a drug manufacturer. He just as clearly didn’t care. The officers continued pawing through the vehicle. They eventually exhumed a bottle of methadone that had been prescribed to Diane’s son Larry, a habitual drug user who had been through several rehab programs. 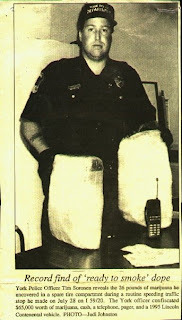 A few minutes later an officer found a pouch containing drug “paraphernalia” – which Larry admitted belonged to him. As a child, Diane and her siblings had been seized by “child protection” bureaucrats in Mississippi and scattered across the state. When Soronen announced that he was going to handcuff the adults and call for the child-snatchers to collect the children, Diane’s reaction was immediate, and visceral. She broke down entirely – which was the intended result. “What do I have to do to prevent DHR from picking up my grandkids?” Diane pleaded. Soronen insisted that Diane would have to “confess” that all of the Sudafed was hers. He didn’t explain that this put her over the legal limit in Alabama. Soronen's roadside interrogation of Diane lasted roughly an hour. The entire incident was captured by way of a concealed recording device worn by the officer. Only a few minutes of that recording was played in court -- the portion containing her purported confession. In her appeal, Diane is demanding that the complete record be entered into evidence. During the five weeks she spent in Marengo County Jail, Diane was denied the rudimentary decencies of a human existence. Blankets and sheets were withheld from her, leaving her to freeze on a bare metal bunk. For an entire week, she and the other inmates were deprived of utensils and forced to eat with their fingers. Each inmate was given a single set of clothes. The 17-hour torture session in the restraint chair inaugurated a regular course of smaller acts of calculated cruelty by the jail staff. “When common household medications and disinfectants are now illegal to possess, I believe we have gone overboard in the drug laws,” he observes. Embellishing on that point, it should also be said that when your local pharmacy clerk is a police informant ready to report you for buying an over-the-counter cold medicine, it should be obvious that, whatever the USA may have been at one time, it has formally degenerated into a reich. Avera’s case is particularly infuriating – not just because of the practiced viciousness with which Soronen used her grandchildren as hostages, but also because the snitch that got the grandmother in trouble works for a large corporation that was spared federal charges for its admitted role in providing large amounts of pseudoephedrine to meth manufacturers. Since 2005, over-the-counter cold remedies containing pseudoephedrine have been treated as a controlled substance. Jeffrey Tucker of the Ludwig von Mises Institute points out that “Before 2005, you could by as many Sudafed packages as you did Big Mac sandwiches…. Now, your 30-allotment is nine grams,” which for most people won’t survive the cold and flu season. The government-approved replacement is a placebo. In predictable fashion, this created a flourishing black market for pseudoephedrine. Cash-strapped people are eagerly acting as “smurfers” – that is, proxy buyers who obtain huge quantities of Sudafed and other cold remedies on behalf of meth dealers. About a year ago, CVS, whose corporate leadership admits that it knowingly allowed extensive purchases of pseudoephedrine by “smurfers,” avoided criminal charges and given a large fine that was passed along to customers. As Avera’s case illustrates, the pharmacy chain is also eager to aid in the prosecution of small-time defendants who purchase forbidden amounts of cold medicine. Some of them face years in prison – where meth and other illegal drugs are readily available. This is particularly true in Alabama. The Averas point out that Diane is not the only Mississippi resident who was entrapped in Marengo County’s Sudafed snare: During her ordeal, Diane met another Meridian-area woman of similar age and background who fell prey to the same racket. Unlike Diane, however, the other victim (who prefers not to be named) accepted a plea deal from Griggers. Soronen’s name appears in the 2009 case Baney v. State, in which the Alabama Court of Criminal Appeals upheld the conviction of a man who had been caught in one of Soronen’s child predator stings. The ruling describes how Soronen “developed several teenage-girl profiles in an Internet chat room,” two of which attracted the attention of John Baney. Which is more loathsome – pursuing sexual liaisons with underage girls, or exploiting those depraved impulses by playacting the role of a potential victim? That question is best pondered by someone equipped with a mind more subtle -- and a gag reflex less sensitive -- than mine. This much, however, is indisputable: Someone who would wring a confession out of an innocent woman by using her grandchildren as hostages is a child predator at least an order of magnitude more contemptible than John Baney. ... for the kind donations to help keep Pro Libertate on-line. While supplies last, I will continue to send a personalized copy of Liberty in Eclipse to anyone who contributes $20 or more. We really appreciate your kindness. Thanks, and God bless! Be sure to check out Republic magazine.